and is sold world wide. 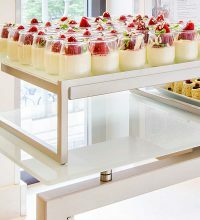 Büchin Design developed an elegant buffet furniture range for the high demands of the hotel industry and for exclusive events. 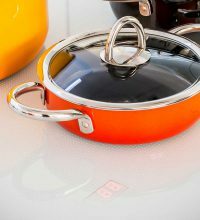 It is equipped with a range of technical features to keep dishes hot or cold. 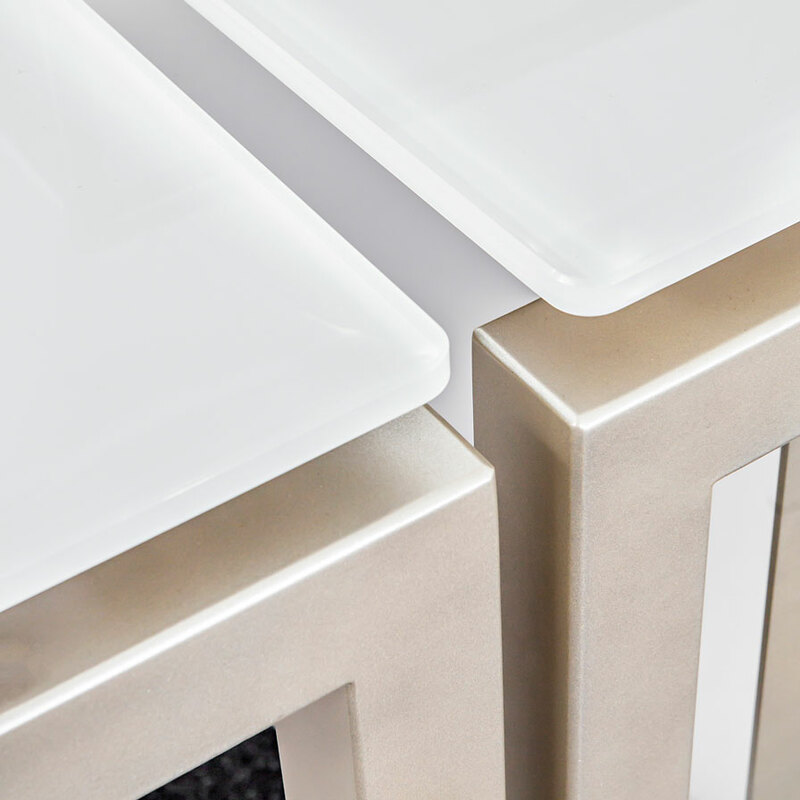 Our VENTA buffet tables are meticulously designed, down to the smallest detail. They have an elegant and high-quality design, but also have a level of flexibility and functionality that allows them to meet the diverse requirements of the hotel, events and catering industry. The buffet tables can be assembled and disassembled in just a few simple steps and without the need for any tools. 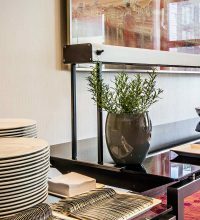 Thanks to the sophisticated trolley system, the buffet tables can be transported and stored in even the smallest spaces. 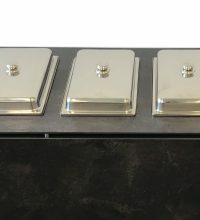 In addition to their functionality, the emphasis is also on the exclusive and elegant design of our VENTA buffet tables. 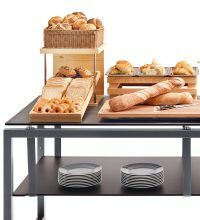 We have applied a modern design to our exclusive buffet furniture, giving it a stylish and high-quality appearance, and concealing how flexible, versatile and practical it is. 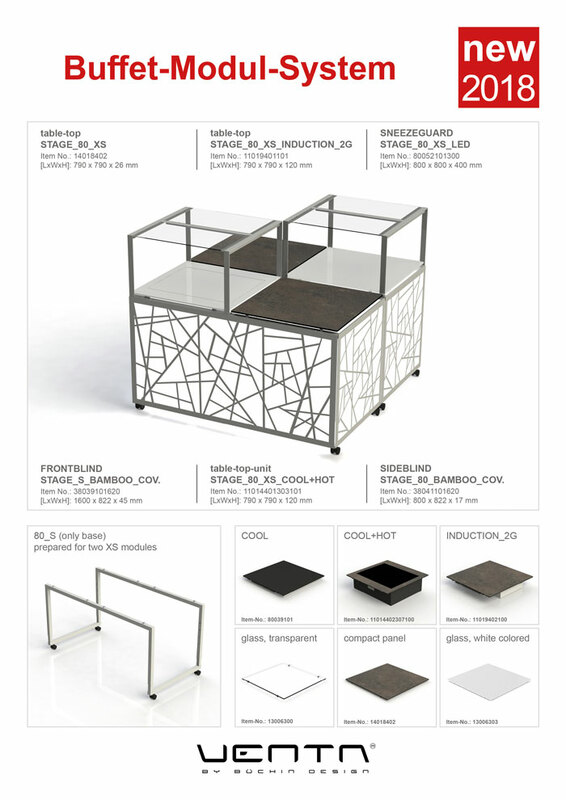 All VENTA furniture has special features that make our exclusive products distinctive and unique. 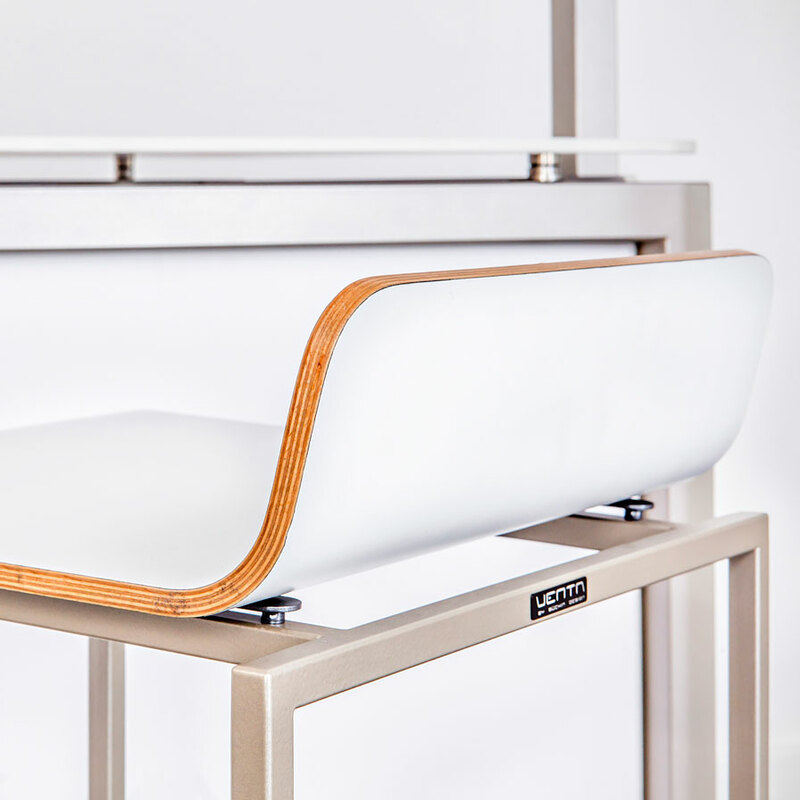 Each individual product was designed as a foldable, stackable or modular system, so our high-quality furniture can always be securely stored, taking up very little space. 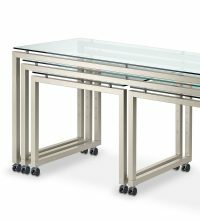 A matching trolley system is available for all VENTA furniture items, where the table parts can be stacked individually and secured in place against one another. All VENTA furniture is put together without the use of any tools and there are no parts that can get lost. 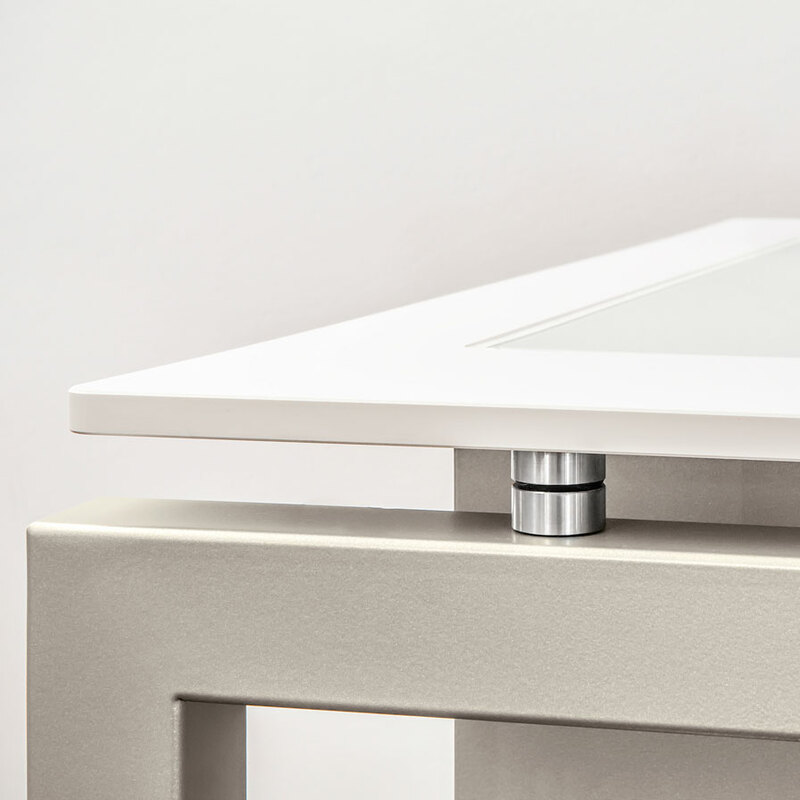 The connecting elements between the table frame and table-top are always made of stainless steel and are produced using high-precision lathes. The consistent quality of our products is ensured through regular physical controls. 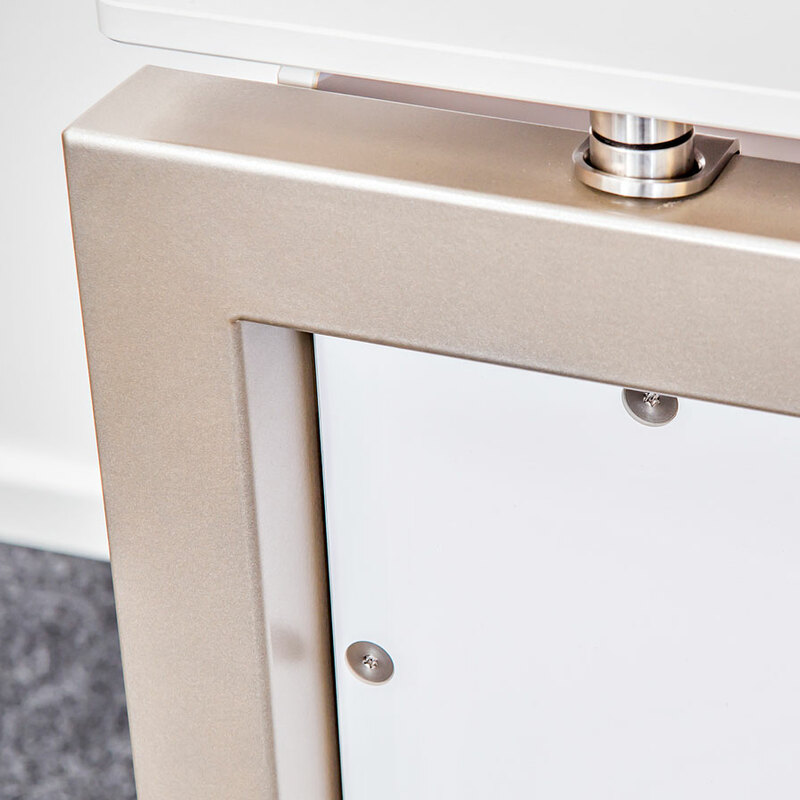 VENTA products are designed as foldable, stackable or modular systems, enabling our furniture to be stored securely and using very little space. 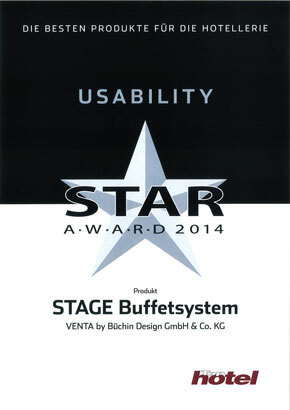 We also offer additional equipment for many VENTA products to make them even more simple and convenient to manage. All foldable tables can be equipped with rollerskates, for example. 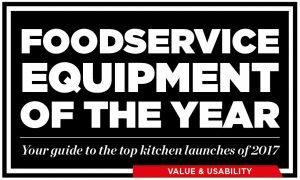 This enables the buffet tables to be moved around the room quickly and easily without having to carry them or take them apart and put them together again. 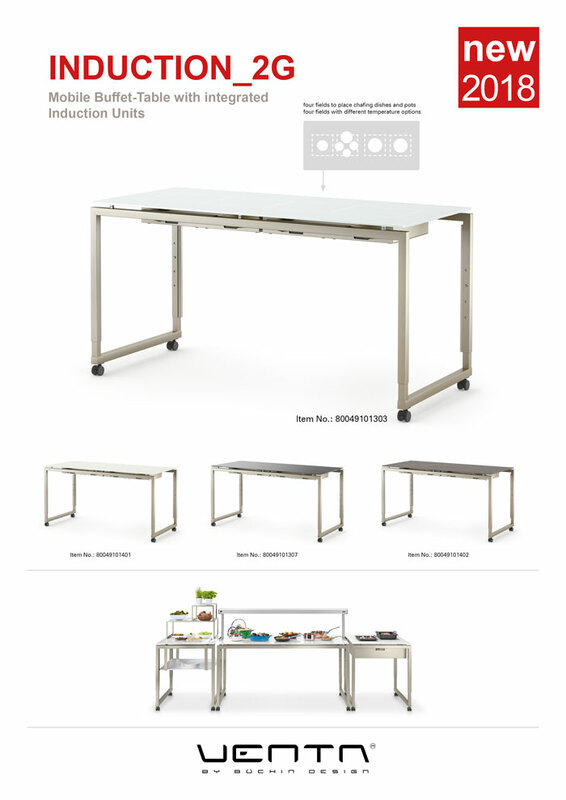 SYSTEM SIZE table system available in three standard lengths (L=196 cm, M=180 cm, 2 x XS=80 cm). NESTING the three standard sizes can be pushed together, so that only 1.96 m of the 5.36 m buffet table length is required as NESTING system. 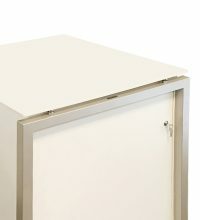 COMBINE system available in two table depths, 80 cm = classic buffet size/50 cm = table depth for smaller meeting rooms. Combinations of the two table depths result in interesting buffet variants or e.g. a MOBILE BAR. 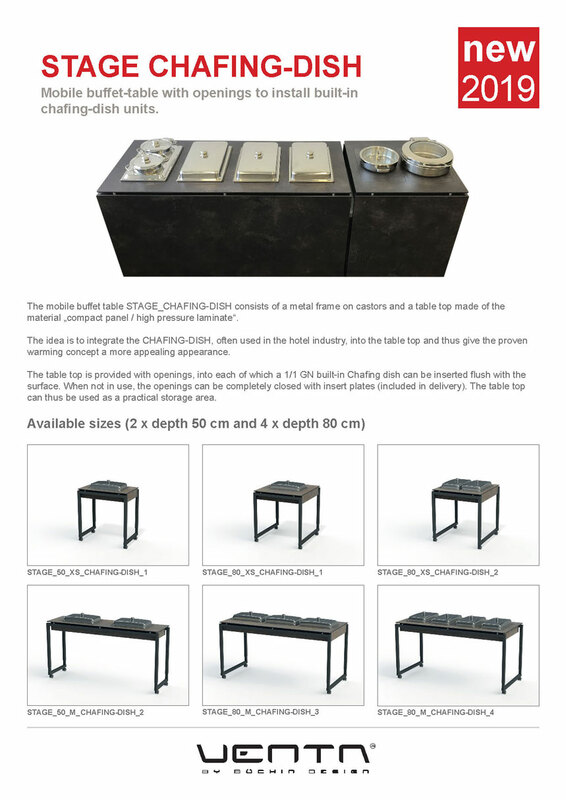 ADAPTIVE each table can be optimised for the respective area of use with additional equipment (e.g. shelves below the table surface for use as a plate shelf). 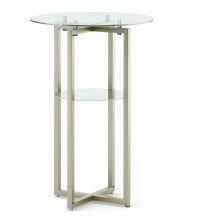 CHANGEABLE a light, elegant buffet system consisting only a metal frame for the table legs and a transparent glass top. Or a buffet system with full equipment including appliances for heating and cooling, thermal bridges, shelves and blinds – STAGE can do both. FUNCTIONAL wheel diameter in three sizes suitable for the application: small = in the room or on the floor/medium = in the whole hotel, also suitable for lifts or smaller thresholds/large = inhouse and outdoor, also usable on the terrace. 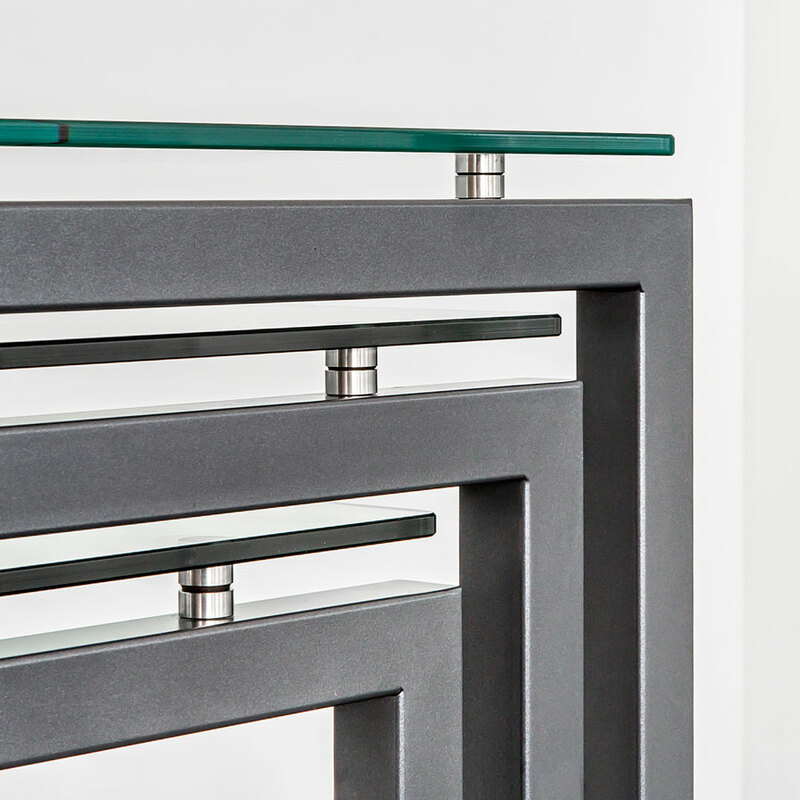 ADJUSTABLE HEIGHT four table heights can be adjusted at each table in a grid of 8 cm, thus enabling an interesting and varied furniture construction. MOBIL buffet table on wheels, which can be moved in any room and throughout the hotel, all wheels are lockable to fix the table in place. STORAGE if required, the system can be dismantled without tools and stowed in trolleys (wooden boxes on wheels), each part has a fixed place due to a grid system and cannot be damaged during transport. COLOR elegant lacquering of the table frames and the table tops (underside of the glass tops), so the matching color to the room concept is selectable. DECOR table tops available in „compact top“ material with various decorative surfaces (photo reproduction: wood, stone, metal). BLINDS various decor panels to choose from, variants from completely closed to translucent, can be quickly assembled and disassembled by magnet attachment, enables „invisible supply“. Warm plates at the buffet. Stylishly integrated into the VENTA buffet line. 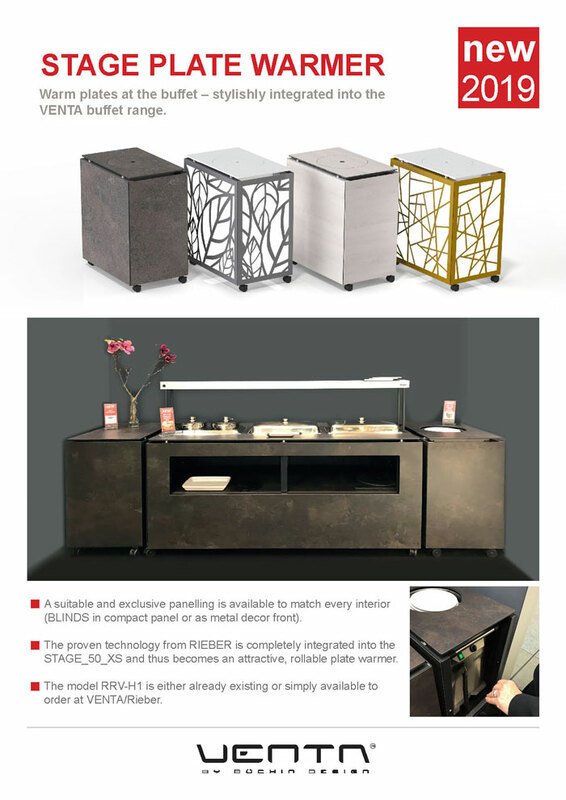 Buffet-Table with one to four openings to install CHAFING-DISH units, which are fully integrated in the table surface. 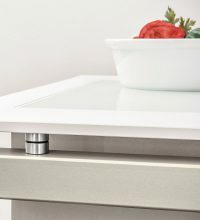 VENTA recommends to use SPRING or WMF units as we designed a special magnetice holder to place the remote control direct under the table. 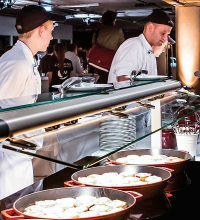 The BUFFET SETUP 200 PAX is a planning aid which enables F&B managers to create a suitable setup for their event. 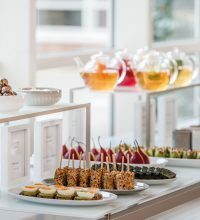 Different systems for the cooling of the salad area and the presentation of the bread station make the buffet look more appealing. 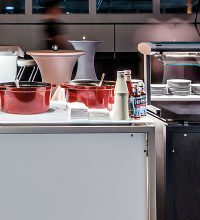 In using induction heaters or classic chafing dishes VENTA offers two options for keeping food warm at the Hot Buffet Station. 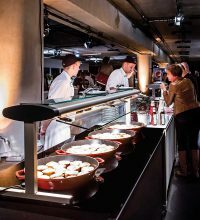 The buffet can be supplemented with a live cooking station that offers action and the possibility to prepare dishes "à la minute". VENTA disposes of a variety of table combinations, also with cooling functions, to present juices and desserts, glasses, napkins etc. VENTA cocktail tables in addition to elegantly designed stools and the special MOBILE BAR are mainly used for cocktail receptions. 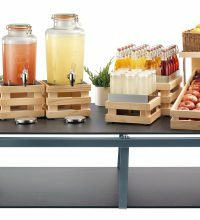 All food and beverages areas can be excellently equipped with VENTA tables as they all fit together and can be combined as desired. Our exclusive STAGE tables are available in three lengths and two depths and are equipped with an integrated height adjustment. 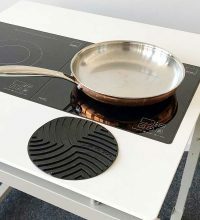 The INDUCTION_COOK is a practical table with two flush-mounted hobs surrounded by a surface of the material "compact plate". 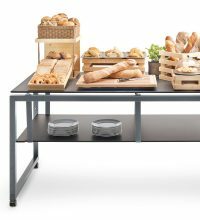 INDUCTION WARM is a height adjustable buffet table system on wheels with integrated induction fields for keeping food warm. 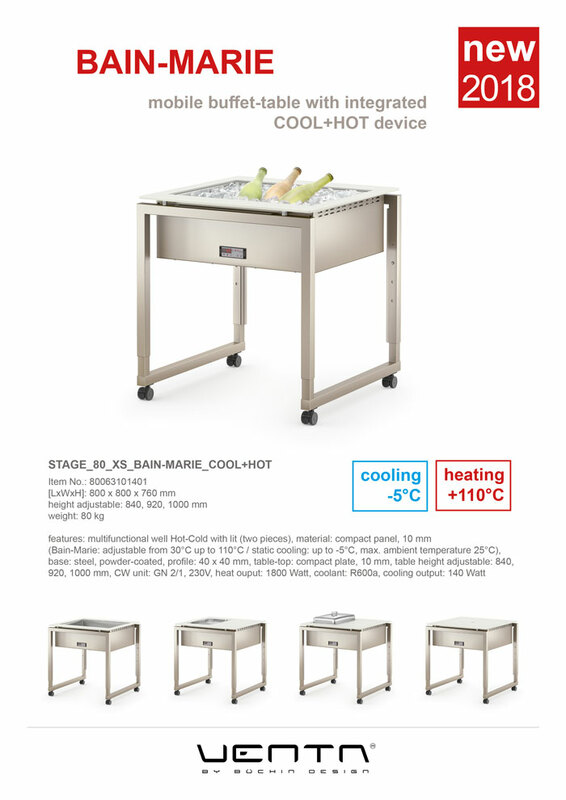 The mobile buffet table BAIN-MARIE with integrated hot-cold tub allows to be used both as a cooling table and to keep food warm. 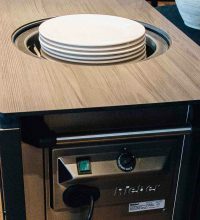 VENTA integrates the CHAFING-DISH into the table surface and thus gives the proven warming concept a more appealing appearance. 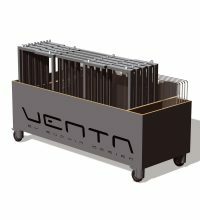 VENTA developed a passive cooling and an electrically operated cooling which also can be used to heat and keep food warm. The TEPPAN_GRILL table is designed for use in live cooking for short and sharp browning to prepare special dishes "à la minute". 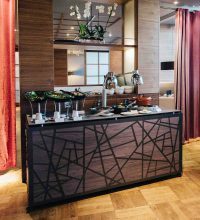 Warm plates at the buffet – stylishly integrated into the VENTA buffet range with exclusive panelling to match every interior. 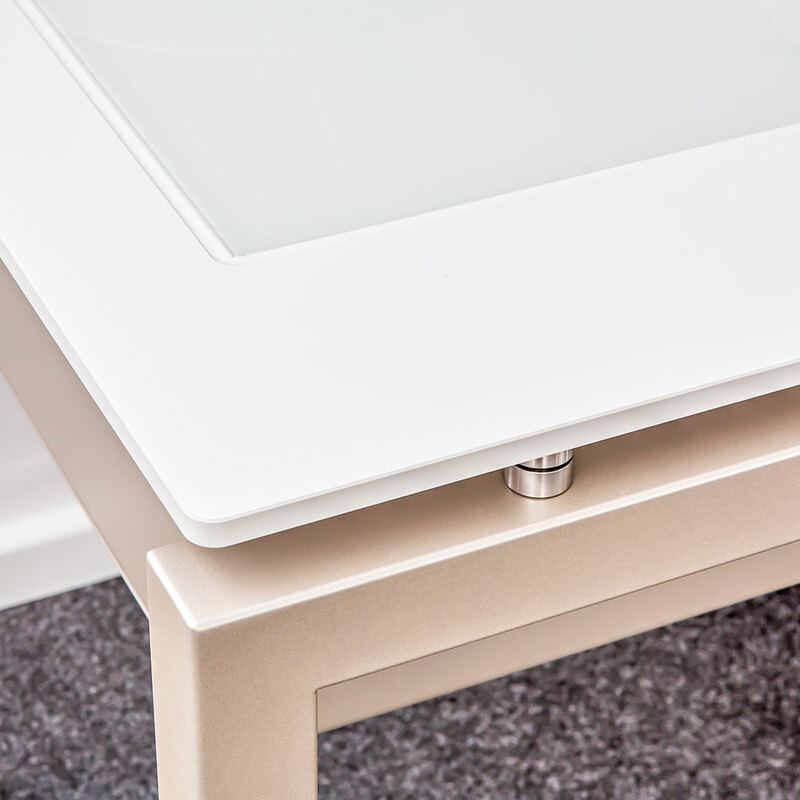 When using VENTA tables with heating function, it is recommended to use a heatbridge to generate additional heat from above. 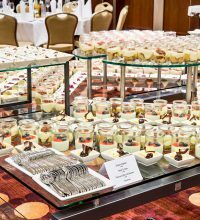 The VENTA TABLE RISERS have been developed to complement the STAGE buffet table system and to make the buffet look more appealing. The COOL RISERS are a combination of the STAGE_ETAGERE and the cooling batteries to keep food cold but attractively arranged. 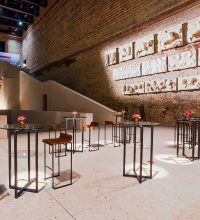 VENTA has a suitable tray for all STAGE tables which is suspended under the tabletop by three metal brackets available in two heights. 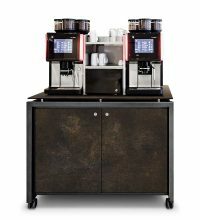 The supply of the coffee machine (fresh water, water filter, waste water tank) is fully accommodated in a lockable cabinet on castors. The CUPBOARD is similar to a buffet table but designed as a lockable storage space with shelves insight and door at front. In addition to its function as spit protection, the SNEEZEGUARD can also be used as a buffet extension for decorative purposes. Our BLINDS for the STAGE table system can be quickly and easily connected to the table frame via a combined magnet and hook system. 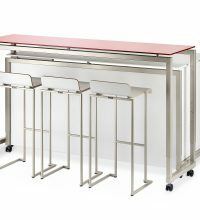 The proven STAGE buffet system from our VENTA Interior range can be converted into a mobile bar in many color and material options. 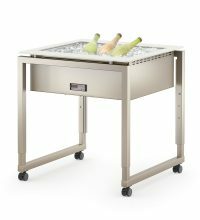 The exclusive VENTA cocktail tables can be moved, adjusted and stowed easily because of a clever folding and stacking system. 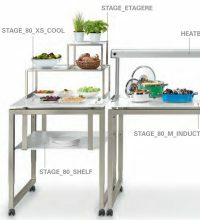 The VENTA trolley system ensures the transport, storage and fast and convenient assembly and dismantling of several buffet tables. Sign in to our newsletter for free.